FC Barcelona sealed their place in the semi-finals of the Copa del Rey in style on Thursday night, with a 5-2 win over Real Sociedad at the Camp Nou, adding to the 1-0 win at Anoeta seven days prior. It took a while for the hosts to get going, but a relentless display of quick attacking football in the second half saw Barça comfortably through to the last four of the cup for the seventh successive year. The early exchanges saw the away side look to contain Barça before selectively picking their moments to edge out of their half. Barça meanwhile dominated possession but were unable to ask any significant questions of the Real Sociedad backline in the opening 15 minutes. Just as he did against Eibar, Denis Suárez got Barça going with a neat right footed finish across goal. The move started with Samuel Umtiti stealing the ball from Xabi Prieto, before Neymar, Leo Messi, and Luis Suárez helped the ball on to Denis who kept his nerve where it mattered. The other Suárez then thought he made it 2-0 minutes later as he shifted the ball past goalkeeper Geronimo Rulli before slotting home, but the linesman’s flag would deny the Uruguayan with a very tight call. By this point, the visitors could no longer sit back with the tie drifting ever further from their reach. The next chance of the game would fall to their feet, with striker Willian José attempting an acrobatic effort which went just over the bar. Early in the second half came a defining moment in the game, and possibly in the fate of the tie. Carlos Vela was played through on goal and though Jordi Alba’s tackle managed to stop the Mexican, the ball fell kindly to Willian José who looked odds on to score, but some excellent reflexes from Jasper Cillessen kept Barça ahead. And on the counter attack, Neymar’s lung-busting run saw him through on goal and was only stopped by a last-ditch lunge from Iñigo Martínez. The penalty was duly awarded and Messi made no mistake from the spot to put Barça 2-0 up, seconds after it could very well have been 1-1. Real Sociedad, to their credit, refused to give up and with half an hour still to play, managed to get a goal. A lofted ball over the Barça defence from Martínez played Juanmi through in space and the Spanish striker cleverly lobbed over Cillessen to make the tie interesting. Yet things would swing back in Barça’s favour in the blink of an eye. Almost immediately from kick-off, Messi fended off the pressure of two defenders to be able to thread the ball through to Suárez and the lethal striker, as we have come to expect, expertly took the ball in his stride before prodding the ball beyond the onrushing Rulli to give Barça their three-goal aggregate cushion. Little did the 58,000 spectators at the Camp Nou that there were plenty of goals still to come. Elustondo’s pinpoint cross found Willian José in the box and the Brazilian this time made no mistake in front of Cillessen. The Brazilian’s header flew into the net and Sociedad again had a sniff (3-2). 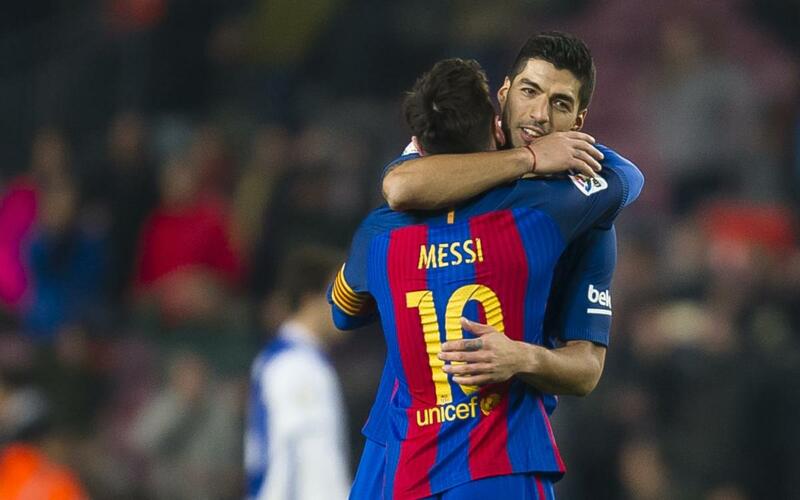 Yet there would be no revival for the Basques, especially with Messi in the mood he was in. The magical no.10 played his part in yet another goal as he set up Aleix Vidal on the wing who then fizzed the ball across goal and, while Luis Suárez could not quite reach it at full stretch, Arda Turan was there to tap the ball in for 4-2 on the night. The scoring was finally complete on 82 minutes. Messi was again the architect, this time threading the ball through to Denis and, with the confidence of his recent goals, the midfielder had the composure to round the keeper before tucking the ball away (5-2). Barça will find out their Copa del Rey semi-final opponent during Friday’s draw, where they are joined by Alavés, Atlético Madrid and Celta.